Sam Welsford (Western Australia) produced one of the rides of his career to claim his second Australian individual pursuit national title, powering home ahead of reigning world champion Jordan Kerby (Queensland) in a hotly contested final. In the women's individual pursuit it was Ashlee Ankudinoff (New South Wales) who found herself back on the top step of the podium in the individual pursuit having won the title in 2016 ahead of two former winners in Amy Cure (Tasmania) in silver and Rebecca Wiasak (ACT) in bronze. The sprint competitions are shaping up to be a thrilling battle with fastest qualifier Stephanie Morton (South Australia), joined by Kaarle McCulloch (New South Wales), Caitlin Ward (Victoria) and Maddie Janssen (Victoria) as the final four heading in to Saturday's semifinal. Matthew Glaetzer (South Australia) leads the charge in the men's sprint, with Nathan Hart (ACT), Jacob Schmid (Victoria), Tom Clarke (South Australia), Tylah Meunier (Victoria), James Brister (South Australia), Braeden Dean (Victoria) and Conor Rowley (Victoria) in to the quarterfinal. Defending champion Patrick Constable (South Australia) was eliminated in the first round after a tactical display by Meunier. Earlier in the day McCulloch grabbed the 500m time trial title, adding it to her Oceania Championship success in November. The Under 19 women's title went to Brooklyn Vonderwall (South Australia). Welsford caused the upset of the week outpursuiting world champion Kerby in a thrilling pursuit. A fast starting Welsford took the lead after the opening lap with the duo evenly matching each other for the first two kilometres with less than two tenths of a second splitting the pair. At the half way point Welsford put on the after burners and powered away, quickly taking a lead of more than a second. 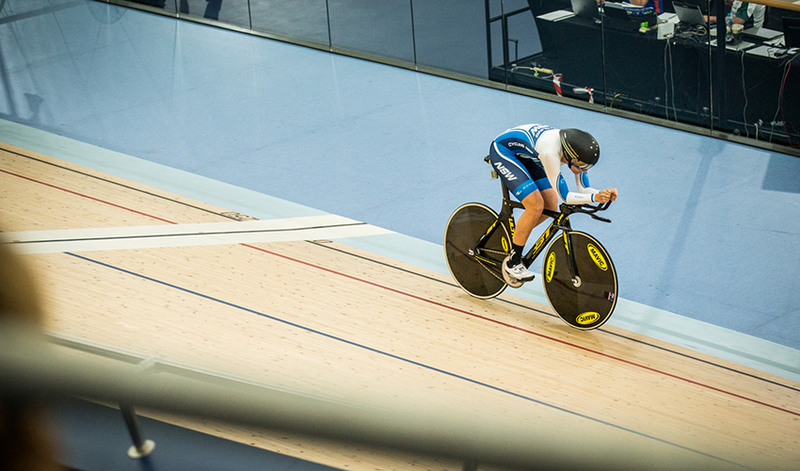 Before riding away to his second individual pursuit national title. It was a similar affair in the ride for bronze with a close battle between world championship bronze medallist Kelland O'Brien and his Victorian teammate Leigh Howard. In a ride that came down to the final lap O'Brien proved too quick holding off Howard to take the final spot on the podium. World Championship silver medallist Ankudinoff took the lead after the opening lap and never looked back taking gold in 3mins 31.064secs as she held off a consistent ride by Cure (3:31.972). Dual world champion Wiasak completing the podium in 3mins 34.616secs. A late charge by Oceania Championship silver medallist Lauren Robards (ACT) in the second half of the two kilometre pursuit earned her under 19 gold in 2mins 26.707secs, defeating fastest qualifier Alice Culling (Victoria-2:30.012). Bronze went to 2017 winner Alex Martin-Wallace (Queensland) in 2mins 26.565secs. The under 19 men's event was taken out by Blake Quick who added a second title to his omnium gold in 3mins 21.272secs with a finish that went down to the final metres as he just held off Matthew Rice (ACT-3:21.611). Luke Wight (South Australia) collected bronze in 3mins 19.777secs. Glaetzer confirmed his status as the world's fastest man stopping the clock in 9.757secs to top qualifying ahead of Schmid (9.887), Hart (9.917) and Clarke (9.924). In a throwback Victoria's young sprint trio Meunier, Dean and Rowley all made early attacks catching their rivals napping. Meunier claimed the biggest scalp putting defending champion Constable out in the first round with Dean beating Matthew Richardson (Western Australia) and Rowley beating Max Housden (New South Wales). In other round one rides Schmid defeated Mathew Mooney (ACT), Hart defeated Daniel Rickard (ACT), Clarke defeated Jackson Williams (ACT) and Brister defeated Luke Zaccaria (Western Australia). Morton got her title defence off to a flying start stopping the clock in 10.809secs, the only rider under 11 seconds. McCulloch (11.048) and Ward (11.240) rounded out the top three. Morton's run to Saturday's semifinals saw her move directly to the quarterfinals where she dispatched Rikki Belder (South Australia). McCulloch was too strong for Felice Beitzel (ACT) and Tahlay Christie (Western Australia), Ward advanced over Selina Ho (New South Wales) and Holly Takos (South Australia) with Janssen completing the final four beating Christie and Sophie Knox (New South Wales). A fast a furious under 19 men's competition saw Leigh Hoffman (South Australian) unleash a potent turn of speed to be crowned the 2018 champion ahead of Thomas Cornish (New South Wales). Victoria's Sam Gallagher completed the podium. McCulloch rode her third fastest time in history and the fastest ever at an Australian Championships to reclaim the title she last held in 2013. The Oceania champion stopped the clock in 34.064secs to take gold, two tenths ahead Morton (34.281) with 2017 winner Breanna Hargrave (South Australia) completing the podium in 34.856secs. Brooklyn Vonderwall (South Australia) stormed home with a stunning second lap, stopping the clock in 35.727secs, adding the time trial to her team sprint victory. Silver went to Alana Field (Victoria-35.829) and bronze Heather May (South Australia-36.813).